You are at:Home»Herbs»Alpinia galanga Willd. Latin name : Alpinia galanga Willd. Description : The dried rhizome has been used for thousands of years in traditional medicines. It is antibacterial, anticatarrhal, antifungal, antiinflammatory, antiseptic, antispasmodic, aphrodisiac, aromatic, bitter, cardiotonic, carminative, cordial, diaphoretic, digestive, diuretic, expectorant, nervine tonic, stimulant and stomachic. It has a slight irritant action on the mucous membrane of the stomach. It is a warming herb used for abdominal pain, vomiting, nausea and hiccups, as well as for diarrhoea due to internal cold. Also useful in catarrhal affections. Has antiinflammatory properties and is useful in rheumatism and rheumatoid arthritis. It is also useful for many respiratory ailments like bronchitis, asthma, whooping cough, etc. Also recommended as a cure for halitosis, stammering and inflammation of the mouth and pharynx. It is considered to be a good remedy for impotence and nervousness. The Arabs ‘used it to make their horses fiery’. 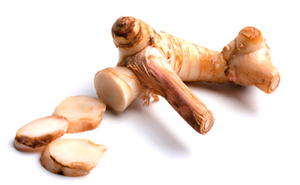 The use of rhizome in impotency and as an aphrodisiac was examined during 1992. It caused a significant gain in the weight of the sexual organs and increased sperm motility and sperm count in male mice. Recommended Dosage : 2 to 4 g powder of dried rhizomes.